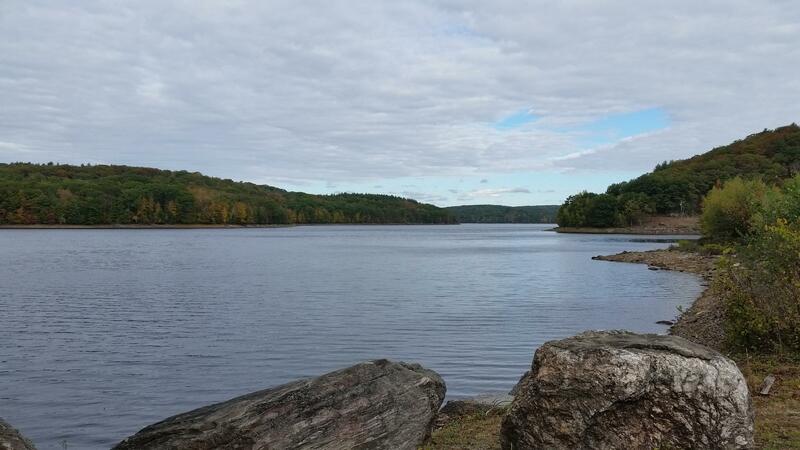 The Cobble Mountain Reservoir is the source of drinking water for about 30 percent of Massachusetts, including the city of Springfield. A required public notification about contamination in the drinking water for Springfield, Massachusetts has officials stressing there is no emergency. Since routine testing last December found higher than allowed levels of haloacetic acids in the city’s tap water, officials from the Springfield Water and Sewer Commission have fielded an average of 40 phone calls a day, posted an FAQ on its website, met with neighborhood groups, and answered questions from a City Council committee. Josh Schimmel, who administers the daily operations of the water and sewer agency, announces at these public meetings that he drinks straight from the tap every day -- confident that there is no acute problem with the water. "The water is safe," he declared in a recent interview. "And we want our customers to really have trust and faith in the water they are drinking. That is really important to us." In the wake of the disaster in Flint, Michigan, public utilities have strived to maintain both safe water supplies and credibility with the public. Schimmel said haloacetic acids are something the commission is required to test for in the drinking water because studies have shown that long-term exposure could cause cancer. The hope is the contamination will be temporary.
" The concern is for long-term exposure. In terms of immediate health concerns, there are no immediate health concerns," said Schimmel. According to the Massachusetts Department of Environmental Protection’s website, haloacetic acids are a byproduct of the chlorine which is used to disinfect drinking water reacting with other naturally-occurring chemicals. Officials believe the elevated levels of the compounds in Springfield’s water can be traced to the higher than normal rain amounts the region experienced last fall. It washed organic material such as leaves, wood, and plant residues into the Cobble Mountain Reservoir. "We had a trend of a lot of rain and that upsets raw water quality, so it will take some time for the raw water quality to settle down," said Schimmel. The next round of water testing will be in March. Shawn Corbitt, who lives in Springfield’s Sixteen Acres neighborhood, said the official sternly-worded notification letter about the contamination violation that was mailed to every water customer in the city, prompted a flood of questions and critical comments about the water and sewer commission on social media. "Because of the concern, I think it is beneficial that the organizations responsible for the letter come forward and say what is going on, and let the people know that this is what's going on, we're aware of it and hopefully will be taking care of it," said Corbitt. At a hearing, Springfield City Councilor Jesse Lederman, who chairs the council’s Health and Human Services Committee, urged commission officials to take steps to prevent the recurrence of high levels of haloacetic compounds in the water.
" What I am going to be looking to is to make sure they continue to take those steps to reduce that level," said Lederman. " A lot of this has to do with the age of the (water) treatment plant. They need to continue to work to bring the treatment plant into more modern regulatory compliance." The commission is working on a pilot program with the University of Massachusetts to investigate alternatives to using chlorine to disinfect water. CORRECTION- According to Jaimye Bartak, Communications Manager for the Springfield Water and Sewer Commission there are no plans to stop using chlorine to disinfect the drinking water. The UMass study involves finding ways to more effectively remove organic materials from the water. In this segment from WAMC’s in depth look at infrastructure series, WAMC’s Pioneer Valley Bureau Chief Paul Tuthill reports on how the largest municipality in western Massachusetts gets its water. Although many pipes are more than a century old, the utility infrastructure in Springfield, Massachusetts is in good shape and is continually being upgraded, according to officials who spoke at a public forum. The roundtable was scheduled after a water main break last month caused a large sinkhole on Main Street and raised concerns about what is happening underground. Renowned environmental activist Erin Brockovich visited Albany Tuesday to join advocates in calling attention to the prevalence of Legionnaires’ Disease in New York.